THE MONSTER IN ME, THE MONSTER IN YOU: a review of "Colossal"
In the "I-will-definitely-give-points-for-trying" category, I now turn your attention to "Colossal," the odd, awkward, a little messy but undoubtedly creative and inventive feature from Writer/Director Nacho Vigalondo. 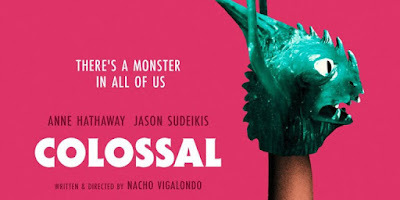 During our era of sadly unimaginative 21st century cinema, a film like "Colossal" certain is a welcome sight as it is indeed a film that I have definitely not quite seen before and I did appreciate Vigalondo's efforts. But appreciation doesn't always translate into full enjoyment as the film seemed to have needed another run through the script writing word processor in order to tighten the connective tissues of the plot as well as the greater themes that film clearly had upon its mind. Even so, I'd rather have a not quite successful original film than another tired re-tread any day. 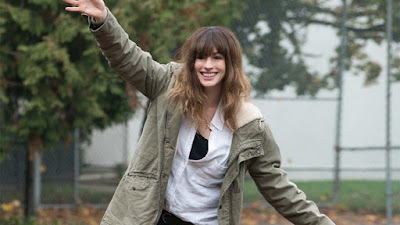 "Colossal" stars Anne Hathaway in one of her most enjoyable, committed and less self-aware performances in many years as Gloria, an alcoholic, unemployed writer who has partied far too long and has burned so many bridges, that her long suffering boyfriend Tim (Dan Stevens), evicts her from their shared New York apartment in order for her to at long last finally get her life back on track. Shamefully returning to her empty parents' home in an unnamed small Midwestern town, Gloria is soon reunited with her old grade school classmate Oscar (a strong Jason Sudeikis), who has never exited their hometown but now runs a local bar he inherited from his deceased parents. After kindly offering Gloria a part-time job as a waitress at the bar plus purchasing some supplies for her new living arrangements, it would seem as if our heroine would finally have a foothold into regaining a stronger foothold in her life. But unfortunately, each and every night, Gloria drinks until the morning light or until she passes out alongside Oscar and his friends Garth (Tim Blake Nelson) and Joel (Austin Stowell). Meanwhile, across the world in Seoul, death and destruction is abound as a gigantic monster has been terrorizing the city causing damage and carnage. While Gloria watches the footage on-line and on television screens in horror, she is soon further astonished to make the discovery that she herself is actually in control of the creature as her own movements and gestures upon a neighborhood playground during early morning hours, completely dictate the actions of the monster itself. As Gloria attempts to battle her demons, figurative and literal, she also is forced to come to terms with Oscar's more duplicitous intents, which are gradually growing in its own intensity. Nacho Vigalondo's "Colossal" is a comic fantasy that does a fine job keeping us off guard for the duration of its running time as the premise is so unusual and provocative that I do think that if you choose to see this film, you will be in for a treat as it is something far off the beaten path. As previously stated Anne Hathaway does some especially fine work as Gloria, a walking catastrophe yet one who is more than endearing as her compassion shines vibrantly through even when she is behaving as her hottest mess. It was certainly more than a pleasure to view her more unfiltered, looser, less Hollywood so to speak. While I think she has more than proved her mettle as an actress, I have felt that she has fallen into a sort of red carpet readiness that has become a tad off-putting performance wise. With "Colossal," she is fully genuine again, more than willing to look ridiculous as well as tap into some fearless emotional territory. Jason Sudeikis was indeed a surprise as he displayed a subtlety, shading, depth, sorrow and rage that has really has not had the opportunity to display as of yet. Without providing any spoilers, he matched Hathaway beat for beat, certainly conveying a complete, personal history between their respective characters, a history that fully informs all of the events that eventually unfold in the film. I felt that this was an area where Vigalondo succeeded fairly well, as he utilizes the monster in Seoul and all of the cataclysm as some powerful metaphors for the inner worlds of Gloria and Oscar, as they are both self-destructive drunks, and triumphantly self-absorbed, as their behaviors fully suggest that they each view the world revolves around themselves. Yet, now here is a living, breathing Godzilla like monster that is the manifestation of Gloria's inner turmoil, so she therefore and literally has the world revolving around her behaviors. Furthermore, the themes extend themselves into concepts of how one does view their place within the world and how the successes and failures of our lives formulate our behaviors in the world in which we all co-exist. In regards to Gloria and Oscar, two individuals for whom life has thrown more than its share of obstacles and has crushed respective dreams and wishes for themselves, how might they each take their wounds and failures into the larger world? With recrimination and revenge, or would empathy remain, despite the heavy internal baggage? With that in mind, Nacho Vigalondo has created a film that works quite well as a fantasy, a thriller, a dual character study and a satire. And yet, "Colossal" never fully congealed into something cumulative for me. In fact, once it was all said and done, I even wondered just what the purpose of it all was as the various parts never fastened themselves together smoothly, where the genre qualities and the more thematic qualities worked in tandem so tightly that one could not function without the other. In fact, as I watched "Colossal," I found myself thinking about the films by Writer/Director Edgar Wright, most notably "Shaun Of The Dead" (2004), "Scott Pilgrim Vs. The World" (2010) and "The World's End" (2013), where he utilized a zombie apocalypse, videogames, and an alien invasion to furthermore explore themes of male arrested development to brilliant degrees. With "Colossal," Vigaondo's characters did feel to be a tad underwritten and scenes themselves seem to function as non-sequiturs rather than as strong storytelling but his creative energy was almost just enough to give the film overall a big push. Nacho Vigalondo is nowhere near the filmmaker that Edgar Wright is, but give him some time and a greater attention of how to move a film from scene-to-scene as well as from genre to inner frame-workings, and he just might be. We shall see and I am already curious if he will become a colossal filmmaker. But, on the other hand, considering just how busy life and its responsibilities will be during this month, perhaps the lack of new theatrical films will be a blessing in disguise rather than a hindrance fueled by a lack of creativity. Perhaps, I was really spoiled with the greatness I have already seen this year. "Colossal" is a film that I have just now heard about and it is one that has received some intriguing notices as well. I am wondering if this will be released in my city this month and due to its strangeness as witnessed from the trailer, I feel compelled to try and seek it out. Beyond that film, there still is that small pile of features that have been patiently waiting for me to screen them and maybe that should be my focus this month, before the big summer tentpole releases arrive in May. So, as always, I ask of you to simply please send me the best of your well wishes and I will deliver the same back to you. I'll see you when the house lights go down!!! !